Some weapon systems and mission profiles require quick detach (QD) methods for vertical grips and other tactical accessories. Ideally, this design would allow a wide range of adjustment to fit MIL-STD 1913 to Weaver- type commercial rails. It would also require no tools to tighten or loosen the mount, and be as light and strong as possible. It would not open accidentally when caught on webbing or gear. We found just such a Quick Detach. 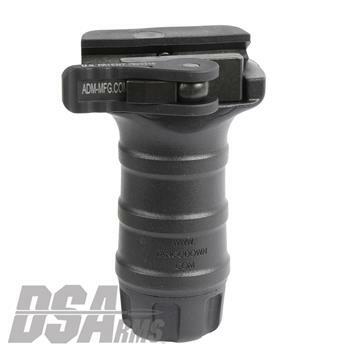 The BGV-QD series grips feature American Defense throw lever QD mounts. No tools required for installation or removal. Aerospace grade materials, with TYPE III hard coat anodize, guarantee performance in the field, no matter how harsh the environment. Combined with our premium impact and heat modified polymer, this grip will survive any beating you can give it.